The only problem is that the features in the App will be fully functional only if you updated your device to the Nokia Amber update for Lumia Phones. So currently only Lumia 925 which has Amber will be able to optimally use this settings. Nokia has announced that Amber will soon be available for all Lumia phones somewhere in August 2013. Now about the display + touch App. With this App you can just hover your hand over the see the Glance screen. For this you have to just activate the 'Peek' in the menu as shown in the image above. 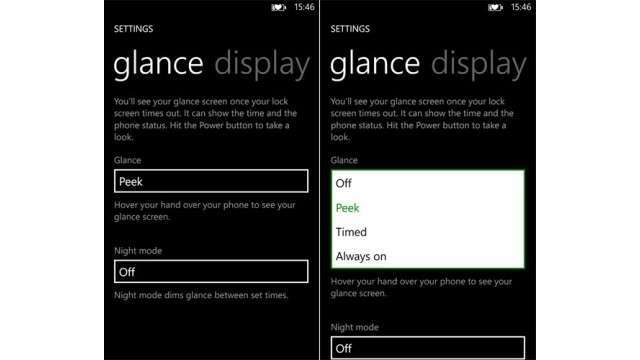 Once you activate the 'Peek' option, you have to hover your hand over the screen of your Nokia Phone like a magician and it will turn the display on to give you a view of the Clock and notifications. The 'Peek' display will stay afloat for a minute or two which should be enough for you to either glance over the time in the clock or unlock the phone if you have any notification. This beautiful use of the proximity sensor will be a first for any OS but the sad part is you will have to wait for the Amber update till August 2013 unless you have Nokia 925 with you. If you indeed have Nokia 925 then visit the Windows Phone App store and download this must have App and show your magical skills to your friends.